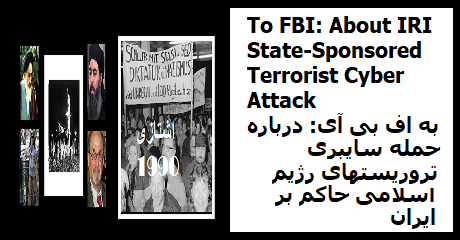 To FBI: In the last 24 hours my home Internet connection has been under Cyber Attack which I believe is state-sponsored terrorism by Islamic Republic of Iran (IRI) that I refer to as IslamicKKK (1). You know my home Internet address, and I would appreciate it if you could monitor and find the sources of these attacks. Also if you do a google search of two keywords <Sam Ghandchi> and <homosexual telegram group> all in Persian (2), you can see a few articles taken from my web site and reprinted, but the reprints are infected with viruses which I think is also their action. I would appreciate it if you can investigate these attacks and take the necessary action. Thank you.